The longer this Brexit farce goes on, the more people are coming to realise that Theresa May and the hard-right fringe of the Tory party are making a total bloody mess of it. Theresa May's hubris cost her her parliamentary majority, and now she has no choice but to dance to the tune of the most rabid hard Brexiters. She bribed the DUP bigots £1 billion for them to support her, but they apparently get to call the shots on the Brexit process and humiliate her on the world stage by tearing up her Brexit concessions behind her back just as she was about to hand them in to the EU negotiating team. She's elevated several of the worst Brexit liars into her cabinet (Boris Johnson, Liam Fox, Micheal Gove and Priti Patel - who was only jettisoned after she was caught acting as an agent of a foreign state embedded in the UK government). She's desperate to please Paul Dacre, the rabidly right-wing editor of the Daily Mail, knowing that if she makes one wrong move Daily Mail hacks won't be whipping their readers up into a hate-mob spewing death threats at Dominic Grieve, Anna Soubry, Sarah Wollaston, Brexit critiquing academics, or parliamentary sovereignty respecting judges, they'll be coming after her. And then there's the demographic trapdoor she's positioned herself over by appealing to the fanatically right-wing ultra-nationalist Blue-kip demographic. If they dissipate, then Labour would obviously storm to victory, so she's got to keep them happy with plenty of extremist rhetoric. But her problem is that the majority of them are 65+ and they're gradually dying off as the electorate is being rejuvenated at the other end with youngsters who generally abhor the disgusting hard-right bile May needs to spew in order to keep her Blue-kippers happy. All these factors together mean that Theresa May is being dragged towards an extreme hard Brexit by the Brextremist mob, and there's virtually nothing she can do to stop the situation deteriorating further and turning ever more people against the extreme hard-Brexit position she's taken. Under these circumstances it would seem sensible to just let them get on with digging themselves deeper and deeper into their fanatical and increasingly unpopular hard-Brexit hole without adopting an equally off-putting position at the opposite extreme of the debate. Of course there are loads of Leave supporters who don't propagandise for the hardest most destructive form of Brexit or erupt in frenzies of animalistic death threat spewing rage whenever anyone acts to defend parliamentary sovereignty from Theresa May's anti-democratic plotting. 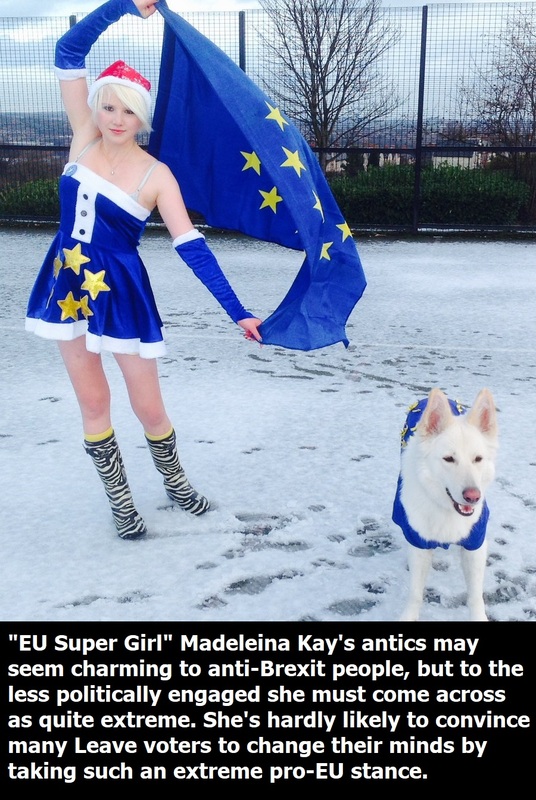 And of course there are loads of Remainers who recognise that the EU is far from perfect, but who have massive reservations about staggering chaotically out of it in an unplanned "let's make it up as we go along" Tory Brexit that is being administered by the incompetent dregs of the hard-right fringe of the Tory party. 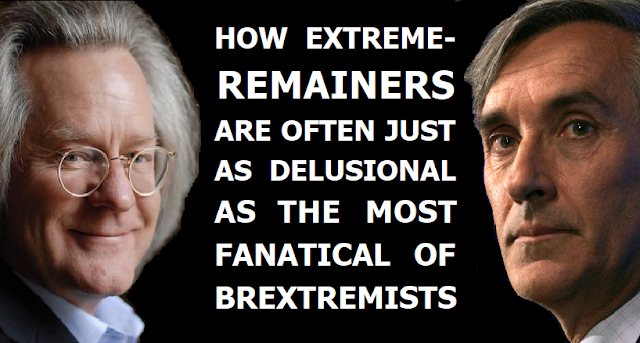 In my view the majority of British people actually fall into this middle ground of relative Brexit moderation, however the minority of highly vocal Brextremists are matched by another minority of extreme-Remainers who are often just as prone to delusional thinking as their polar opposites. Take AC Grayling as an example. I don't have a problem with the guy banging on all the time about how bad Brexit is. Everyone's entitled to their opinion, and to be fair to him, the toxic brew of incompetence, malice, secrecy and anti-democratic Brexit scheming from the Tories makes a lot of what he's saying about Brexit being a terrible idea ring dead true. What winds me up about him is the absurd delusion that Labour would be doing so much better if they had a leader who opposes Brexit as vehemently has be does. Grayling's latest absurd expression of this view is his claim that Labour would be on 65% in the polls with an alternative anti-Brexit leader. If only Labour had a leader to tell half the voting public they're idiots who need to be ignored, then they'd become more popular than even Margaret Thatcher or Tony Blair were at the absolute peaks of their popularity! 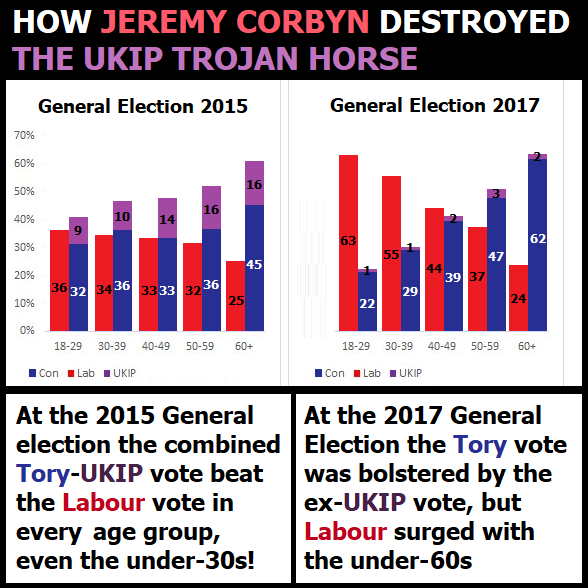 What Grayling and his ilk ignore is that Jeremy Corbyn pulled off a political miracle at the 2017 General Election by inspiring the biggest increase in the Labour vote since 1945. 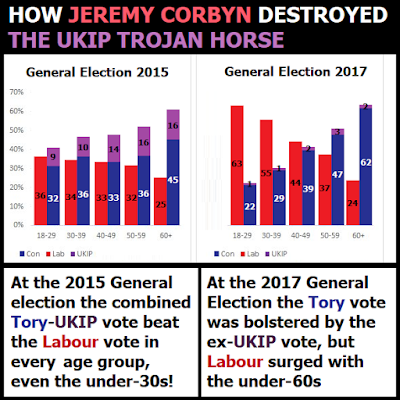 Corbyn did this by doing two things that were considered politically impossible; bringing out the youth vote and engaging millions of previously disillusioned non-voters, which increased the Labour vote by 3.5 million. It's only by creating this massive upsurge in Labour support that Corbyn managed to do the seemingly impossible and prevent the combined Tory+UKIP vote from winning a massive majority with which they would have enforced pretty much the worst kind of hard-right autocratic Brexit imaginable with nobody to moderate their most terrifying extremes. Would a Blair type figure pushing a "sore loser" campaign have achieved such a huge reversal of the long-term Labour decline? I strongly doubt it given that the Lib-Dems actually ran a "sore loser" campaign in 2017 and somehow managed to slightly reduce their vote share from what most politically engaged people assumed to be their absolute nadir in 2015. And then there's the 65% figure. Where is Grayling's justification for such an extraordinary claim? There simply isn't any justification for claiming that replacing Jeremy Corbyn with a "Remaniac" would result in such an unprecedented surge of Labour Party support. In fact this 65% figure is exactly the same kind of unjustifiable hyperbole/made-up-fact rubbish that the Brexiteers lobbed around so gratuitously during the referendum debate isn't it? The idea that an anti-Brexit Labour leader would suddenly begin hoovering up support like no political leader has ever done before is clearly an extraordinary delusion, and it's obvious where the delusion is stemming from. People who are highly engaged in politics (and I include myself in this) have a tendency to massively over-estimate how engaged everyone else is in stuff like politics, economics, constitutional matters and legal affairs. The extreme Remainers have conned themselves into believing that tens of millions of ordinary people give as much of a damn about the intricacies of the Brexit process as they do themselves. So the ludicrous fantasy of an anti-Brexit white knight Blair-type figure riding an unprecedented wave of popularity into Downing Street to completely cancel Brexit actually seems like a realistic proposition to them! The extreme-Remainers are clearly just as prone to delusional thinking as the Brextremists, while the great majority of people who haven't adopted such an extreme polarised opinions look on in bemusement at the crazed fanaticism from both sides. In my view openly pining for an anti-Brexit Blair type figure to somehow take over the Labour Party and nick the Lib-Dems' anti-Brexit stance is as futile as it is delusional. Such a move wouldn't cause people to flock to the Labour cause as Grayling is imagining, in fact it would likely result in a huge exodus of voters, leaving the Tories to resurrect themselves by painting Labour as a disrespectful and out-of-touch metropolitan elite and as an anti-democratic bunch of sore losers, thus shoring up their Blue-kip vote while the Corbyn surge fades away. In my view the best course of action for those who are (rightly) worried about the way Brexit is panning out is to continually fight against the kind of hard-right ultra-nationalist anti-democratic Brexit the Brextremists are pushing for, by relentlessly holding the Tories account, and pointing out that they're doing the bidding of a tiny minority of extremely noisy Brextremist puppet-masters. Just think about it. Even if the entire concept of an anti-Brexit white knight appearing to usurp the Labour Party wasn't totally ludicrous in its own right, who are the likely candidates? Chuka Umunna? David Lammy? Neil Coyle? Yvette Cooper? A triumphant return for Tony Blair himself? 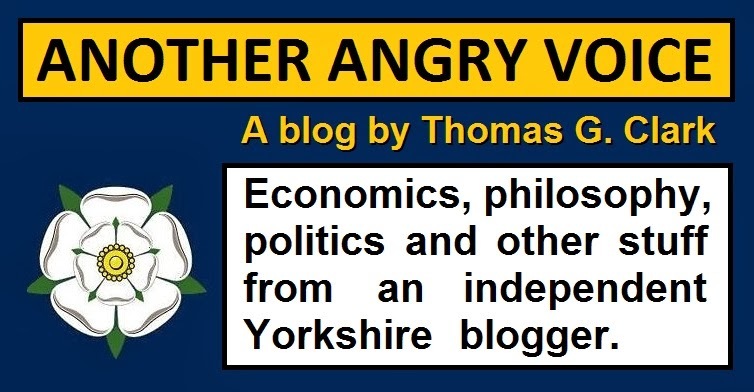 You'd have to be even more out-of-touch than the most crazed Brextremists to think that binning Jeremy Corbyn and the fantastic 2017 Labour Manifesto and replacing them with a hardline Remainer from the discredited right-wing of the Labour Party would be such a massive mega-hit with the Labour Party membership, or with the general public. But apparently there are people who actually believe in nonsense like that, just as there are Brextremists who believe that we can perform a ruinous cliff edge "no deal" Brexit and end up better off as a result!